I remember the first time I got to choose my college classes. I was so excited about having (some) control over when I took classes and where I would study. This was freedom I didn’t get in high school and I was bound and determined to make the most of it. Unfortunately, my newfound college freedom brought along some not so great things, like anxiety when I had to rush to cram for a test because I procrastinated with my studying. I know things are probably pretty similar to you because the last time I checked Twitter, tons of college students were talking about how stressed they were while preparing for finals, and that there never seemed to be enough time to fit it all in. Honestly, it almost seems impossible at times. But even in the midst of all the chaos that comes with studying and going to class, I realized that there are quite a few errors that I made when it came to managing my time in college. When I finally addressed the ways I was managing my time wrong, I started to turn things around. That’s when I started getting more A’s and had a better grip on my schedule so that I could work without sacrificing my ability to do well in class. 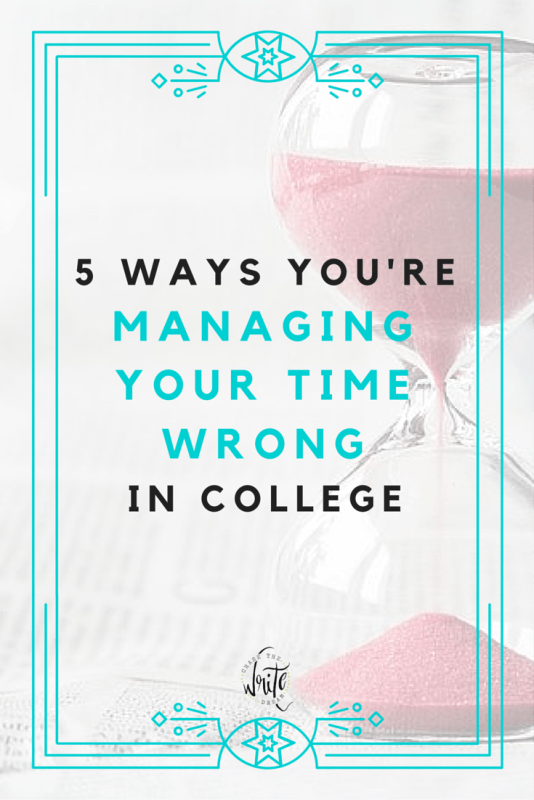 I want you to have that same kind of success, which is why I’m listing the five ways you’re managing your time wrong in college. If you looked at my planner right now, you’d see things penciled in for well into next year. When I was a college student, I had my entire degree plan mapped out, including which classes I was taking which semester. By planning all of this out, I knew what was coming so that I could plan accordingly. What I’m noticing is that so many college students are getting too caught up in the struggles they are dealing with in the present moment, that they are failing to look further down the line. This tends to set off a snowball effect where things just get progressively more and more piled up until the student has a to-do list that is pages and pages long with no realistic way to complete it all. Action Step: If you haven’t written down your schedule for at least the next month (including meetings, classes, work, study sessions, etc. ), then go do it now! It’s all about priorities people. The way you spend your time sets up the stage for how you are going to dedicate your time in the future. Look at it like this: You’ve been in a relationship for six months and all of a sudden you decide you only want to see the other person once a week, but you still want all the benefits of being in the relationship. As the weeks go on, you notice that more and more problems begin to escalate in your relationship, and you get a feeling that everything is all about to fall apart. Managing your time in college really isn’t much different. If you ditch class regularly and don’t study, then you’re going to perform poorly on exams and assignments, and that leads to bad grades. You see, we all have things that we would rather do during the day than the so-called non-exciting things on our “must do” list, but the truth is that if we do only things that we want to, we’ll never make progress toward our goals. Instead, we’ll end up with short-time gratification but long-term negative consequences. Action Step: Take out a sheet of paper and divide it into two columns: Must Do and Want to Do. List at least a few items that you must do today and then put checkboxes next to them. Now, write at least two things you want to do. Make this a visual reminder that in order to do the things in your “want” column, you must first complete the “must” column. It’s like a mini reward system! Technology has radically changed the way we manage our time, but even with all the cool apps and features we have access to, people are still really bad at getting things done on-time. One of the things I encourage all of my students to do is to at least have some type of written out schedule on you at all times. Personally, I use my planner and carry it everywhere I go (except on the days when I really don’t have a “must” list to complete… then I just use sticky notes on my nightstand). This written schedule might not be able to ding at you ten minutes before class to remind you to start walking across campus, but it will give you a visual representation in your own voice of what you need to get done. 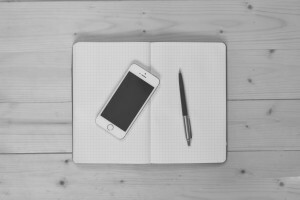 Simply writing your schedule out is a powerful tool in itself. In fact, it’s much stronger at helping you remember things than typing on a computer! Besides, phones have been known to glitch and run out of battery, so it never hurts to have something extra on-hand! Action Step: Start implementing a back up method to keep track of your schedule. Consider buying (and using) a planner, print out a calendar, or come up with your own system! It takes a lot of self-control to say “no” to your friends when you have a big project due at the end of the semester that you need to start working on. But then you start making that excuse again. And again. And again. Eventually, you get to the point where you are so overwhelmed and stressed that you pull all-nighters and sacrifice your self-care practices just so that you can have some work to turn in. Of course, it’s not going to be your best and you may not get the grade you were hoping. Now, I don’t want you to give up your social life completely, but I also don’t want you to completely dismiss the school work that you need to get done. It’s all about finding that balance, which is why creating the “must” and “want” lists above is so important! Maybe you could tell yourself that if you work on the project for at least 45 minutes, then you can go out with your friends. Action Step: The next time you are feeling torn between school work and a more exciting activity, make a deal with yourself that you must work at least 30-45 minutes before going on. Bonus points if your friends joins in with you and gets some of their own work done! We live in a society that is all about instant satisfaction. Not only can we get updates on 100 of our friends in the span of five minutes by simply looking on our smartphone, but we also have exposure to unlimited amounts of information and entertainment. Although all of these little enjoyments add some relief to our busy schedules, they can easily take the place of the larger goals we are working toward. College students all have one obvious goal in common: Graduate. You probably have several more that you are working toward, like getting a job within three months after graduating, living in your own place, or seeing an honors symbol on your diploma. It’s easy to think about these goals when you first start in college because you haven’t yet felt the effects of finals stress and the pressure that simply comes along with getting a higher education, but it’s all too common to lose sight of them when you get caught up in the thick of things. This is when it’s easy to slip into not managing your time wisely as a college student. When you don’t have some sort of reminder that shows you what your larger goals are, it’s hard to see the bigger picture. Action Step: Create a visual reminder of your larger goals, whether it be a dream board or even a desktop/phone background. Having that little reminder can spark motivation in you like you wouldn’t believe! I spent six years in college between undergrad and graduate school, and I can tell you from firsthand experience that managing your time wisely does not always come easily, nor does it happen overnight. Just like anything else, you have to train yourself to be good at it. You have to consistently put things into practice in order to see the improvements. So what if you slip up one day. Keep going. Don’t let what you started this journey for slip away. I’d love to hear what your biggest time management struggles are in the comments below!